The Indigospirit bookstore at 810 Granville Street — the southeast corner of the intersection of Robson Street and Granville Street — is set to shutter its doors in February 2019. Tania Borle, vice-president of retail for the western Canada division of Indigo, confirmed the planned closure with Daily Hive, as the small 5,000-sq-ft store was always intended to be a temporary placeholder in the downtown Vancouver market until the retailer could return with a new replacement flagship-sized store. The Indigospirit opened in a former Aldo space in late-2015, a few months after the company closed its longtime Chapters flagship store in a 52,000-sq-ft, three-level space now occupied by the Sport Chek flagship. 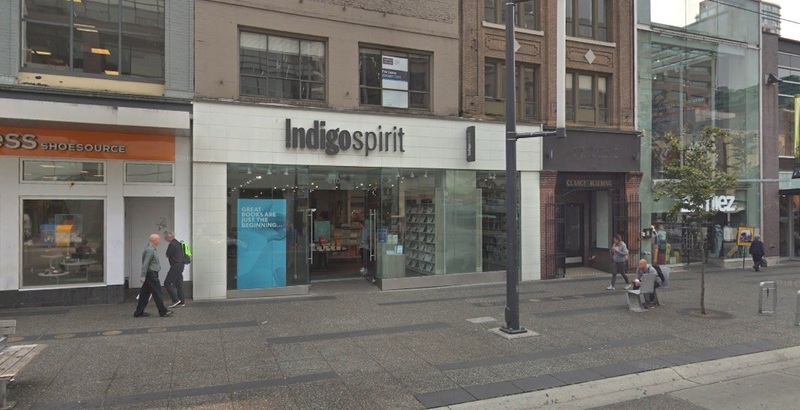 In October 2018, a flagship Indigo bookstore spanning 29,000-sq-ft over two levels — replacing the former Forever 21 store — opened at 1033 Robson Street, about three blocks west from the former flagship and existing Indigospirit. “We are so excited to have returned to Robson’s globally renowned shopping district and serve the book-loving Vancouver community with our new flagship store,” said Borle. It is not currently known what will replace the Indigospirit.